From galaxies to the laboratory, transverse electric currents accompany a main discharge channel. That “main discharge channel” experienced by most people comes in the form of a terrestrial lighting bolt. Slow-motion studies reveal that each flash is a complex episode. Multiple leader strokes descend from the clouds, while similar, less visible potential contacts rise from the ground. Once two points of contact are made, the electrical energy stored in the cloud-to-ground capacitor discharges, drawing current from several square kilometers. To understand the connection that plasma formations in space have with laboratory experiments the scalability of plasma phenomena must be considered. Plasma discharges can produce the same formations irrespective of size. The same patterns appear in laboratories, on planets, around stars, and inside galaxies. What have been called “streamers” were seen inside the shell of gas and dust that makes up the haze around the nucleus of Comet Holmes 17P. They remain in the same alignment as they had since their initial formation. Despite several months of travel, they did not rotate to stay aligned with the Sun. As has been discussed in previous Picture of the Day articles, the braided filaments are the sign of helical Birkeland currents. A few years ago, scientists analyzing data from the Subaru Telescope announced the discovery of a “threadlike structure” emerging from RB199, one of the larger elliptical galaxies inhabiting the Coma cluster. The filament extends approximately 260,000 light years and contains groups of stars enclosed by glowing, ionized shells. Researchers refer to these rapidly moving star cluster knots as “fireballs,” because they look like flaming projectiles shooting out from the galaxy. Duration is also directly proportional to size. Sparks lasting two or three microseconds in the laboratory might scale up to decade-long events at stellar scales, or millions of years at the galactic scale. Filamentary shapes appear to exist no matter where investigators search. 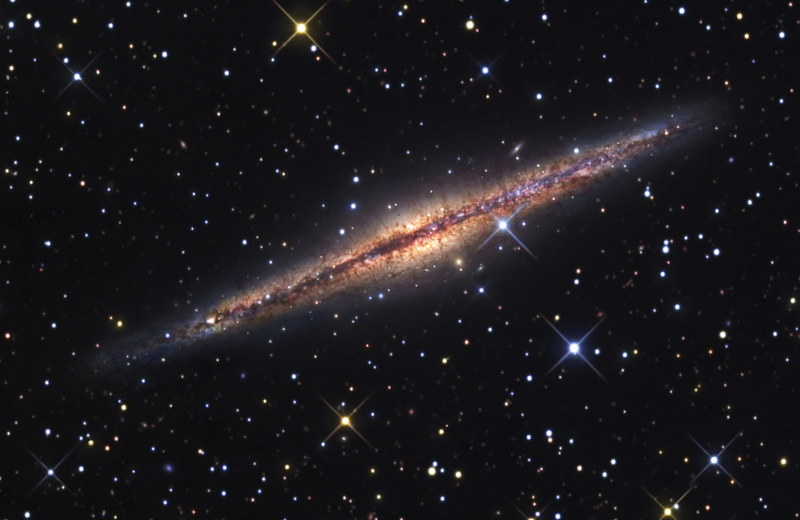 In the image at the top of the page, NGC 891 also displays streamers of material moving away from its equatorial plane at right angles. Could it be that corona arc discharges, an electrical phenomenon associated with terrestrial lightning, are occurring on a thousands of light-years scale?